Do you love dolphins and want to learn more about them? 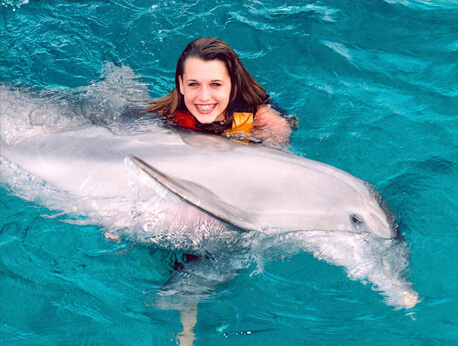 You can swim with, interact with, and play with one of the world's most fascinating animal in the Dolphin Encounter. Hug, shake hands, kiss, and sing with the dolphins as you swim with the ocean’s friendliest creatures. Have you ever observed dolphins swimming, skipping, and playing in the water? It is fascinating and fun to watch, an experience you won't soon forget. Watching them do flips high in the air, jump through hoops, and gracefully glide through the water is an experience of a lifetime. But, did you know that you can also interact and swim with the dolphins in their natural habitat? Get close to nature and learn more about this amazing mammal by participating in our Dolphin Encounter program. Swim with the dolphins in a fun and safe environment on our tour. This program is offered in the beautiful setting in Puerto Aventuras at the Riviera Maya. As part of this program, you will explore and learn more about one of the ocean's most fascinating and fun creatures—the dolphin. The goal of this program is to teach you about these fun-loving and friendly creatures who always seem to be happy and playful. Talk to the experts and ask questions about these wonderful, brilliant, and interesting animals. Interact with the dolphins on a platform in the water and watch them shake hands, hug, kiss, and sing a song to you. You will be amazed at their talented skills. In this program, you will have 10 minutes of instruction and then 40 minutes of play-time in the water with the dolphins. Prices are $99 for adults (13+) and $89 for children (ages 6-12). Kids must be accompanied by a paying adult. If you've enjoyed watching a dolphin show but want to learn more about them and encounter them one-on-one, then consider calling to schedule your very own Dolphin Encounter today! Pet them and feel their smooth skin, give them a hug or a kiss, and make memories that will last a lifetime. Playing with the dolphins in a personal way will be an experience you will never forget and will leave a smile on your face for years to come.